Each lesson features an interactive—and active—bold illustration on a simple background. Fishing poles, complete with real string, bob up and down through the ice. Snowy effortlessly glides down an iceberg and Mom points out the moon in the night sky. Several pages feature more than one pop-up activity, which will engage children quickly. The simple act of turning the page puts Snowy into action on an iceberg; pulling a tab dunks the bears’ fishing poles. Snowy is a simply-drawn yet cuddly bear, a miniature of his mother, with expressions that easily reflect his thoughts and emotions. When he’s happy or worried, the feeling is perfectly clear on his face as well as his mother’s. Each bear even has a bit of yellowish tinge, like real polar bears. The arctic comes off as a fun playground in which to live. The Belgian author and illustrator is prolific in creating children’s books, in many languages and covering subjects as far-ranging as kangaroos and toilet training. He studied painting, drawing, graphic art and photography and has won numerous awards for his books, including the Illustrator’s Award City of Hasselt. 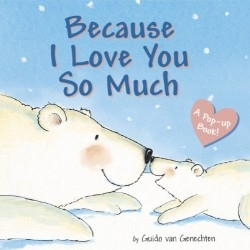 This delightful interactive volume delivers charming lessons on both nature and nurture.